When NPR launched its wine club this fall, I started getting messages from people who knew I’d have an opinion. 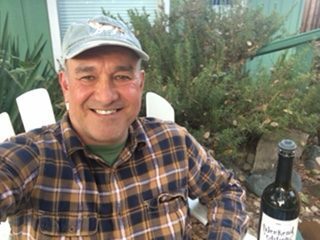 The club is an almost irresistible nexus between my professional life as a public media journalist and news consultant and my avocation as a wine blogger and all-around wine nerd. But first things first. Not everyone loves the idea of an NPR Wine Club. Someone in the Facebook discussion couldn’t decide whether it was funny or lame. More than one person thought it seemed elitist. They’re not the only ones concerned. “We are not now nor do we have any plans to be a ‘lifestyle brand,’” said NPR spokesperson Isabel Lara. She pointed out that several respected national news organizations have wine clubs, including the New York Times and the Wall Street Journal. Florida-based wine educator Jean K. Reilly agrees. The NPR Wine Club’s “welcome offer” includes fifteen bottles of wine for $79.99. That’s $5.33 a bottle — hardly elitist territory, Reilly argued. Philosophical arguments aside, a big question remains: How’s the wine? 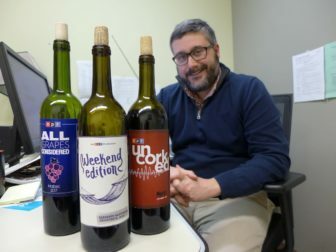 NPR’s partner in this venture is Laithewaites Wine, an established wine delivery service headquartered in the U.K. with operations worldwide. Hard-core oenophiles often eschew wine clubs like this, preferring to choose their own wines from known producers. Given that context, Reilly’s prediction about the NPR Wine Club is much more optimistic than it sounds. 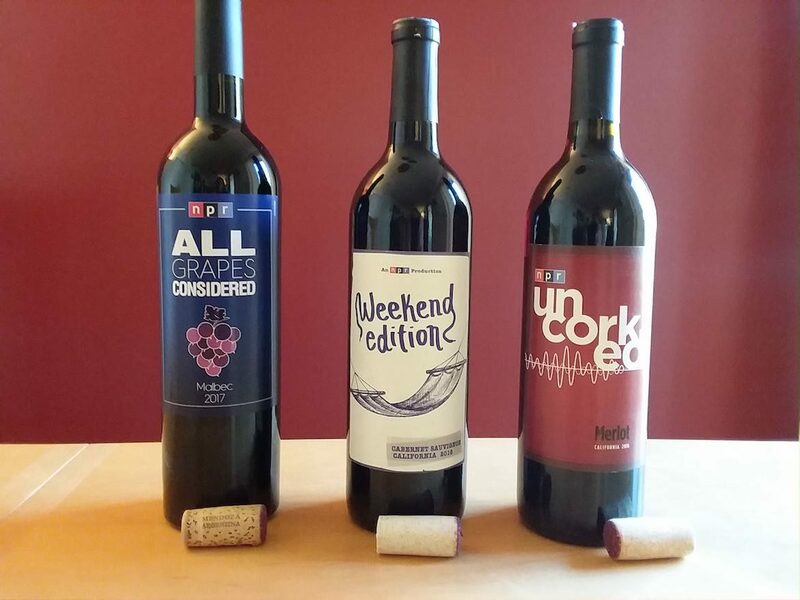 We decided the three NPR-themed “bonus wines” included in the welcome offer should be representative of the club’s offerings. NPR supplied us each with sample bottles, and we got together on a Google Hangout one afternoon for a virtual tasting. While none of the wines blew us away, we were pleasantly surprised by some of the offerings. This wine has what most California cab lovers want — a smooth, rich texture with lots of dark fruits, but with enough tannin (the element that dries your mouth) and acid (the element that makes you salivate) to keep it from becoming cloying. We were more divided on the 2016 California merlot. One thing we did agree on — it’s atypical. “The things that you strongly associate with merlot, I’m really not getting,” Ovshinsky said. He mentioned the lack of chocolate and cherry flavors and aromas that are common to many domestic merlots. The wine is extremely light-bodied — also unusual for this grape. Lopez said he easily could have believed it was a pinot noir. Still, he and Lopez said it would be good for a barbeque, and while I agreed with them on the wine’s lack of typicity, I appreciated its light body and interesting green pepper notes. The words “drinkable,” “enjoyable,” and “inoffensive” came up several times in our discussion, so it stands to reason that we all put the wine in the average-to-above-average range. I was disappointed that a wine named “All Grapes Considered” wasn’t a blend of several grapes. But even putting that aside, I was the toughest grader on this 2017 malbec from Argentina. There just wasn’t much to it beyond a slight hint of — believe it or not — strawberry SweeTarts. My co-tasters were more generous. Ovshinsky agreed, adding steak and ribs to the list of possible pairings. He did share my disappointment in its lack of complexity, especially since malbec is a grape that can offer a lot of bang for the buck. I rated the wine below average; Lopez and Ovshinsky hovered somewhere between below average and average. Overall, Jean K. Reilly’s prediction was correct. There were no “disaster wines” in the lineup, and two of the three were surprisingly pleasing. At first, he pointed out, people tend to like smooth wines like the NPR-themed selections we sampled. As their tastes evolve, more complex wines that once might have seemed objectionable — or dissonant — become interesting and desirable. I do wish at least one of the three NPR wines had been a little dissonant, a little challenging to the palate in the same way NPR’s news coverage and discussion programs are challenging to the intellect. Perhaps that will come with time. Judith Smelser is the founder of Smelser Editing & Consulting, which provides consulting, training and independent story editing for public media newsrooms around the country. 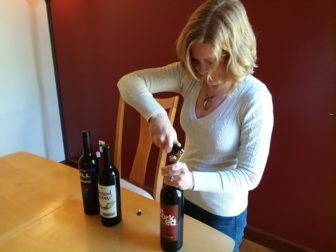 She also writes Scribbles and Scruples, a blog about issues in public media and the craft of journalism, and the Orlando Wine Blog. Smelser is a former managing editor at Colorado Public Radio and former news director at WMFE in Orlando, Fla.